Update: Reposted by popular demand – I wrote the following how-to used by dozens of Xbox 360 fans to score their consoles online. This year, I’m updating for the PS3 and Wii, but this could be used for any number of sites with inventory trackers. Thanks to Bensbargains.net for their Xbox tracker service and Sightmax.com for sponsoring hosting for this site. Here’s a fool-proof way to get notified when PS3/Wii/etc are available for online ordering- no online auctions required. I’ve tested it personally- and received my premium system in time for Christmas. There may be other tactics, but I hope it works for you. Happy Holidays! There are lots of sites that purport to track PS3 shipments. Bensbargains is the best IMO. They’re tracking all the major and a number of minor sites that are carrying the PS3. The site is legit and updated about every minute. Even better is their history list so you can see who got what in and map out when online inventory databases are updated. This is great if you want to check every minute. They also have convenient RSS feeds, but again this requires you to sit there and wait for an update. There’s got to be a better way- something that notifies YOU when status changes? That’s covered in step two. Get notified instantly when a Web page changes, and see exactly what’s changed. With URLy Warning, a pop-up window appears when a Web page you’re watching changes, and you’ll see a visual comparison of what’s been added and deleted. The trial allows you to track one site in demo mode. Once installed, you’ll need to launch the app and proceed to step three. Setting to when at least 3 words are added or deleted will notify you when items go in or out of stock. This can result in a high count, but ensures you don’t miss anything. 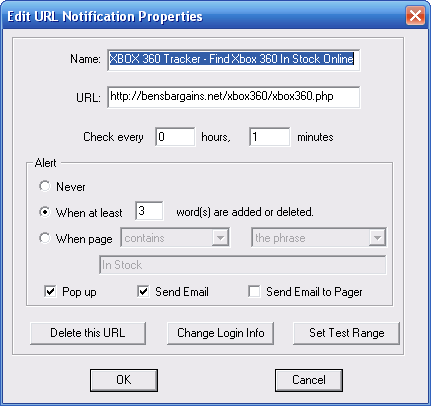 There are other strategies here such as setting When page contains the phrase “In Stock”. Updated Strategy: Search for changes in history onlyKevin writes, “I added a test range to only ping me on changes to the Tracker History by entering ‘History’ in the first text box and leaving the 2nd text box blank. This way, I only get notified when something is in stock and not when a timeout occurs.” Nice addition Kevin- thanks for the tip! Screenie below. I’ve noticed a trend from the east coast- many stores first update their inventory between 5 and 8 am Central time. I’ve saw and let go a number of high priced bundles, before getting a reasonable (MSRP) deal at a major retailer last year on my Xbox 360. Now I’m off to play Gears of War :).Good luck and happy hunting!